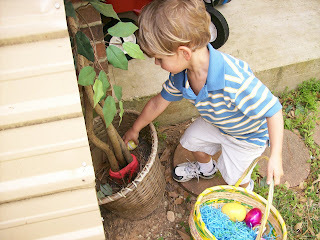 While Dawson enjoyed hunting for eggs, he couldn't wait to open them up to see what treasures were inside. 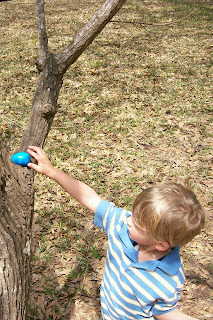 He made frequent stops throughout the great egg hunt to open his eggs and grab the toy that was inside. 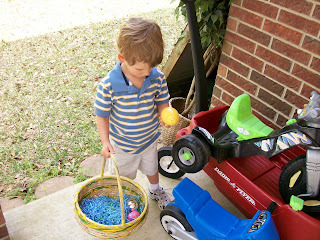 He quickly learned that the big eggs had the coolest toys - matchbox cars and wooden pirate toys. 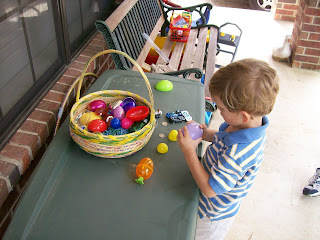 He wasn't very excited about the little eggs as they contained little dinosaurs and coins. All in all, he amassed almost 4 dozen eggs this year! !